Home > baby, Giveaway, Mom, Review, Toddler, Travel > O Yikes ! 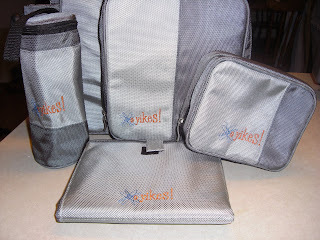 From the Company: "At O Yikes!, we understand that you need a stylish bag to keep up with your ever changing life – from packing your laptop to packing the baby’s diapers. Our bags are designed to keep up with you, whether you prefer to carry your bag as a single strap back pack with our signature hands free Slingback, as a shoulder bag with our more traditional Messenger bag, or even if you need the extra room with our expandable 1960’s retro inspired Square bag." I recently received the O Yikes 24.7 Slingback in Frosted Titanium. The matching accessories which are included are an insulated cylinder case, accessory case, changing pad, and wipes case.This bag is not only functional, but also stylish. I love that I can wear it over the shoulder and my hands are free !!!! 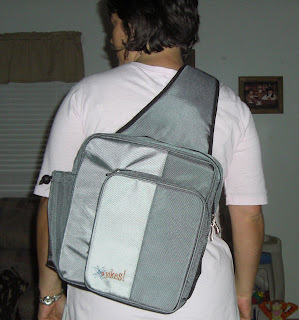 With this bag, I no longer have a need to carry both a purse and a diaper bag. I put the things that I would carry in a purse inside the accessories case . Two great features I really like is they have a handy clip inside for hanging my keys and on the strap that goes across your front has a cell phone holder. No more digging to the bottom of the bag to find them. O Yikes! bags are hip with a practical unisex look. Designed as multi – functional computer bags, fashionable school bags, cool travel bags, and of course as do it all diaper bags. Two large main compartments and six internal pockets helps you keep everything in its place. Have your phone, pda, or mp3 within arms reach with our external accessory holder. Keep your keys in one place with our brushed aluminum key ring. Immediately access drinks in an exterior bottle holder with a drawstring closure. The ergonomic strap is easily adjustable and securely attaches with a Velcro closure and a heavy nylon buckle to fit all sizes. The O Yikes! 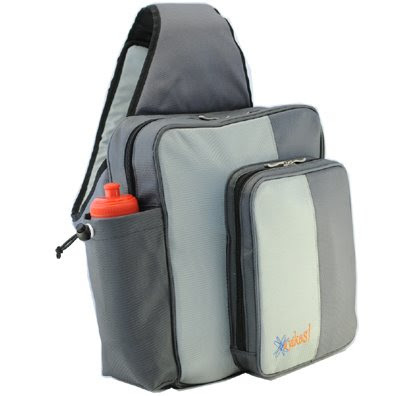 accessory case quickly and easily keeps you organized with two see through mesh pockets. It’s perfect for holding your little essentials for the office – paper clips, post it notes, and memory sticks to items for the little one – medicines, binkies, and toys. The insulated O Yikes! cylinder case can keep hot items hot and cold items cold. Not only is it designed to carry standard size water bottles, it can also hold most bottles and sippy cups. The cylinder case is also perfect for holding other uniquely sized items appropriate for those who “work while one the go” – comfortably holds power cords, pens, pencils, and other slender items. O Yikes ! 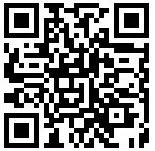 is offering my readers a 25% off discount code, enter "BLUE25" at checkout ! O Yikes! Signature Onesie and a O Yikes! accessory of your choice (Changing Pad or Accessory Case or Cylinder Case ) . I'd love to try the Messenger bag in Blueberry/Keylime! Thanks for the opportunity! I'd like to try the 9.2.5 Slingback. I really like the Messenger bag in Frosted Titanium. Very nice! Thank you! I like the messenger bag. I love the messenger bag in Tangerine Raspberry ,so pretty,the colors are fabulous together and the size ,fantastic! Messenger Bag in Blueberry/Keylime is nice! I'd like to try the Square bag in apricot and chocolate. Thank you for a great giveaway! I also like the square bag in chocolate and apricot. Thank you! The messenger bag looks kind of cool. I really like the Square in Turquoise Chocolate. And you're on my blog roll. I follow you on Twitter and Tweeted this giveaway! I am a Fan/Follower of your blog! Also, I am an email subscriber. I joined your Facebook Network! The messenger bag in Blueberry & Key Lime color is my choice. I like the tangerine raspberry laptop sleeve. The Square bag in Chocolate/Apricot is awesome!! Thanks for the chance. I'd like to try the Messenger bag in purple grape. i like the 9.2.5 Slingback. I like the messenger bag in Blueberry/Keylime and would love to try it, too. I like the Messenger Bag in Blueberry and Key Lime! May 16, 2009 at 4:03 PM This comment has been removed by the author. Oops, I had to delete my first post where I said my favorite bag was the Slingback in Frosted Titanium. It is, but I also like the Messenger Bag in Frosted Titanium. The Messenger Bag in Frosted Titanium looks great! Thanks for the chance! I would like the Tangerine-Raspberry Messenger Bag! I would like the Changing Pad and Wipes Case! I can't believe its only 15 bucks, what a STEAL! The Freelance laptop sleeve is great! I'd like to try the messenger bag -- in blueberry and key lime! I put your button on my blogroll. I love the Turquoise Chocolate Square!